Mind the Gap's Academy runs a range of training courses for adults with a learning disability who want to learn about theatre and different types of performance. As part of their training, students work on professional shows and projects in order to get experience in the subjects they are interested in. This includes acting, dance, technical and media skills and front of house work. Courses are open to people aged 18 and over. All students up to the age of 25 work towards an Arts Award qualification accredited by Arts Council England and Trinity College, London. Being part of the Academy also helps people grow in confidence and get better at communicating and team working. Students can also get support and training for other practical skills such as using computers and travelling independently. The best way to find out more is by coming to a Mind the Gap for a taster session and see if our courses are for you. Come in and spend half a day with this year's students. You will meet the course tutors, get to know the building and try out the kind of work you will be doing if you join a course. To arrange a taster session contact Charli or call 01274 487390. Visit our website for course start dates, application forms and fees: www.mind-the-gap.org.uk/academy. Taking Flight often run courses on various topics including puppetry, facilitator training, Shakespeare, audition technique. These courses are aimed at disabled, D/deaf, sensory impaired and non disabled participants and foster an inclusive learning environment. Please contact the Company to be added to their training mailing list. Please contact Shetland Arts for details of any training courses accessible to young people who are disabled. Please contact Arts Care Gofal Celf for details of any training courses which are accessible to disabled young people. Please contact Dance House for details of any training courses which are accessible to disabled young people. Please contact Dance Base for details of any training courses which are accessible to disabled young people. Please contact Citymoves Dance Agency for details of any training courses which are accessible to disabled young people. Please contact DU Dance for details of any training courses which are accessible to disabled young people. Please contact Dazl for details of training courses which are accessible to disabled young people. Please contact TAN Dance for details of any training courses which are accessible to disabled young people. Please contact Rubicon Dance for details of any training courses which are accessible to disabled young people. Please contact Powys Dance for details of any training courses which are accessible to disabled young people. Please contact Dawns i Bawb Dance for details of any training courses which are accessible to disabled young people. Please contact NEW Dance for details of any training courses which are accessible to disabled young people. Please contact Yorkshire Dance for details of any training courses which are accessible to disabled young people. Please contact DanceXchange Dance for details of any training courses which are accessible to disabled young people. Please contact Dancefest for details of any training courses which are accessible to disabled young people. Please contact Swindon Dance for details of any training courses which are accessible to disabled young people. Please contact Take Art for details of any training courses which are accessible by disabled young people. Please contact Plymouth Dance for details of any training courses which are accessible to disabled young people. Please contact Pavilion Dance South West for details of any training courses which are accessible to disabled young people. Please contact Dance in Devon for details of any training courses which are accessible to disabled young people. Please contact Bath Dance for details of any training courses which are accessible to disabled young people. Please contact Activate for details of any training courses which are accessible to disabled young people. Please contact South East Dance for details of any training courses which are accessible to disabled young people. Please contact MDI for details of any training courses which are accessible to disabled young people. Please contact Ludus Dance for details of any training courses which are accessible to disabled young people. Please contact Dance Manchester for details of any training courses which are accessible by disabled young people. Please contact Dance Cumbria for details of any training courses which are accessible to disabled young people. Please contact North West Dance for details of any training courses which are accessible by disabled young people. Please contact Cheshire Dance for details of any training courses which are accessible to disabled young people. 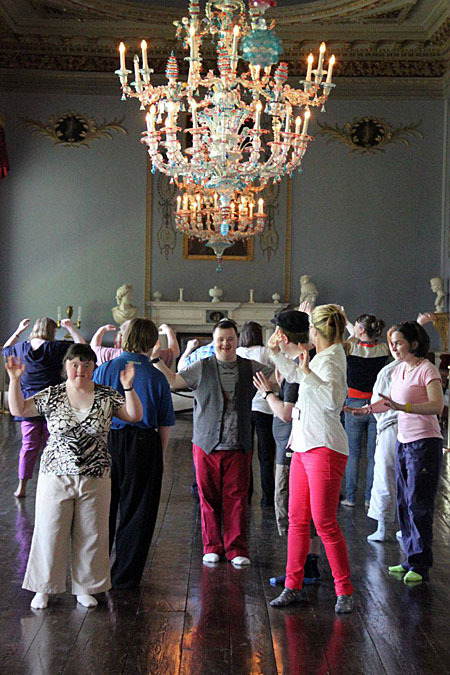 GeTIN2Arts is an exhilarating programme of dance, drama and music tailored to the abilities of people with learning disability. The course covers a wide range of musical and theatrical delights - from acting, singing and dancing to designing and building sets, learning stage craft, script writing and choosing props and costumes. The course runs annually from September to July (36 weeks per year), every Wednesday, from 9:30am until 3:30pm. You will be given the chance to perform to family and friends throughout the year, as well as the opportunity to perform in a professional theatre as part of our annual arts and disability performance event, Best Foot Forward. The course is for anybody aged 18 and above. All activity is adapted to meet the needs of the individual, and the programme is designed to meet both the social and developmental needs of those who attend. The course is fee based. Most people can afford this through Direct Payments. This means that a person attending may have to pay for their place on the course. There are only 15 places available on each course to ensure all participants receive the support and attention they need. The programme is led by two trained artists with extensive experience in working with people with learning disability and there is also a dedicated, fully-trained carer present at the sessions. If you are interested in GeTIN2Arts, please call 0191 384 0728 or email info@tinarts.co.uk. Free taster sessions are also available. TIN Arts have delivered this engaging, stimulating contemporary dance programme to people with learning disabilities in the North East since 1999. Trained artists carefully plan creative dance activities which challenge and celebrate the unique talents of those taking part. You will be given the chance to perform to family and friends throughout the year, as well as the opportunity to perform in a professional theatre as part of our annual arts and disability performance event, Best Foot Forward. The course takes place every Tuesday from 9.30am to 3.30pm from September to July each year (36 weeks) and is for anybody aged 18 and above. The programme is designed to meet both the social and developmental needs of those who attend. The course is fee based. Most people can afford this through Direct Payments. This means that a person attending may have to pay for their place on the course. There are only 15 places available on each course to ensure all participants receive the support and attention they need. The programme is led by two trained artists with extensive experience in working with people with learning disability and a dedicated, fully-trained carer is also present at the sessions. If you are interested in GeTIN2Dance, please call 0191 384 0728 or email info@tinarts.co.uk. Free taster sessions are also available. GeTIN2Academy is a mixed arts course which has been especially designed to support the transition from school to community activity for young adults with a learning disability. It aims to help young people with a learning disability discover and nurture their own performance talent. This means you will have the chance to try dance, drama and music and learn skills such as stage craft, production roles, script writing, designing sets, making props and developing floor plans. There is something for everyone on this interesting, dynamic course. Professionally trained and experienced artists carefully plan creative dance activities which challenge and celebrate the unique talents of those taking part. You will be given the chance to perform to family and friends throughout the year, as well as the opportunity to perform in a professional theatre as part of our annual arts and disability performance event, Best Foot Forward. The course is designed to support people aged 18 and over. All activity is adapted to meet the needs of the individual, and the programme is designed to meet both the social and developmental needs of those who attend. The course runs from 9.30am to 3.30pm every Friday from September to July. The course is fee based. Most people can afford this through Direct Payments. This means that a person attending may have to pay for their place on the course. There are only 15 places available on each course to ensure all participants receive the support and attention they need. The programme is led by two trained artists with extensive experience in working with people with learning disability. There is also a dedicated, fully-trained carer present at the sessions. If you are interested in GeTIN2Academy, please call 0191 384 0728 or email info@tinarts.co.uk. Free taster sessions are also available." Please contact Dance City for details of any training courses which are accessible by disabled young people. Please contact The Place for details of any training courses which are accessible to disabled young people. Please contact Sadler's Wells (Learning) for details of any training courses which are accessible by disabled young people. Please contact Greenwich Dance for details of any training courses which are accessible by disabled young people. Please contact East London Dance for details of any training courses which are accessible by disabled young people. Please contact deda for details of any training courses which are accessible by disabled young people. Please contact Dance4 for details of any training courses which are accessible by disabled young people. Please contact artsNK for details of any training courses which are accessible by disabled young people. Please contact Dance East for details of any training courses which are accessible by disabled young people. Please contact DanceDigital for details of any training courses which are accessible by disabled young people. Please contact Swindon Dance for details of any semi-professional or other training opportunities. Young DaDa encourages and empowers disabled and deaf young people aged 12-25 years through creativity. Creative projects and training have included visual arts, performance, creative writing and film-making with Young DaDa. The programme offers talented young people specific opportunities to showcase their work as well as leadership development. Please contact the organisation for further information. Kick Up is an opportunity for young people to gain an Arts Award qualification. The course is being run for a second time during the Easter holidays 2014 with following up sessions weekly during the summer term. Please contact admin@corali.org.uk or see the website (www.corali.org.uk) for details of any future Kick Up courses. The Company are developing training that will develop the life skills of people who are learning disabled. Please contact the organisation for further details. Bespoke training opportunities for groups who wish to increase their knowledge, confidence and physical skills in an inclusive context. GDance run trainings and intensives aimed at developing the skills of young disabled dancers and choreographers. These include the Inclusive Arts Leadership training course which runs for 10 weeks from June 2015 and combines weekend training sessions with placements and on-line learning. Please contact the organisation for details of current opportunities. In 2013, Solar Bear launched an apprenticeship scheme in partnership with the Royal Conservatoire Scotland. The apprenticeship scheme is funded through Creative Scotland's Talent Hub fund and commenced in April 2013, running for 16 months. Three apprentices were selected from the body of students enrolled in the Deaf Theatre Skills course run by Solar Bear in partnership with the Royal Conservatoire Scotland designed to offer formal routes into the profession for deaf actors. The apprenticeship scheme will help lay the foundations for the UK's first BA Acting degree for deaf students that will commence in 2015 at the RCS. The scheme will look at the development of entrepreneurial skills including innovative and creative thinking, communication skills and the ability to take risks and work towards preparing the Scottish theatre sector for working with d/Deaf practitioners through placements and work experience with theatre venues and producing companies. Please contact gerry@solarbear.org.uk for further information. Out of the Darkness Theatre Company offer training programmes for individuals with disabilities in performance, multi-arts, media and technical theatre alongside performance opportunities. Please contact the organisation for further details. The organisation has offered SVQ awards in sound, lighting and stage management and providing new SVQ awards is a part of the organisation's future training plans. The NC Acting & Theatre Performance course was launched at Moray College UHI in partnership with Out of the Darkness Theatre Company in the 2012-13 academic year and has been a great success already, with many former students progressing to HNC and degree level courses at other universities. The NC course is delivered by experienced theatre professionals and supported by a range of visiting directors and producers who bring with them a wealth of knowledge gained in acting and drama in Scotland and beyond, and provides a great springboard for those who wish to consider further study in acting and drama, or employment in the theatre or related industries. Creativity, self-awareness, communication and teamwork are just some of the skills developed in a realistic setting. In the first intake, four individuals with autism successfully graduated from the course and have gone onto further training. If you have a disability and are interested in accessing this course, please contact Leigh-Anne Hepburn, Development Officer, on 07870 581132 or la@odtheatre.org.uk. The course is designed to allow the development of individual expression through the medium of dance. It promotes proactive, physical engagement in multi-sensory contexts. With the support of the physiotherapy and occupational therapy teams, learners are encouraged to extend their movement potential and mobility through the use of transformational movement equipment. Learners are facilitated to develop specific skills that include non-verbal communication, expression through movement, relationship to others, appreciation, trust and sensitivity. Learners are encouraged to initiate their own ideas and respond to the work of others to create solo, duet and group work. Choreography and directing skills are elements within the dance provision for all learners. Learners have the opportunity to work in partnership with their peers from the local community in inclusive workshops and residencies with visiting dance companies. At the end of each project work is shared with college audiences and in community venues. The three-year music course is designed to enable learners to find their own musical "voice" as a powerful vehicle for self-expression. Through exploration of a wide range of very individual verbal and non-verbal vocal and sound making work, instrument playing and music technology, learners' musical interests and skills are nurtured and expanded. Each project provides an opportunity for practical, experimental music making. Learners are supported to develop solo work in addition to ensemble work. The staff team have a high level of experience in enabling access to music making for those with a wide range of learning difficulties and make extensive use of the latest 'cutting edge' music technology equipment is order to provide access and challenge at all programme levels. There are inclusive opportunities to work in creative partnerships with community and educational groups from the local area. Learners are encouraged to perform to in-house and external audiences. The music department have a very well established link with The University of Lancashire and subsequently hold a 'music week' at college every year that provides an inclusive opportunity to work collaboratively. The department also runs its own record company 'Beaumont College Records' and this provides ultimate challenge for learners with the confidence and ambition to contribute to recordings that are then marketed through our college website. The Performance course provides learners with the opportunity to participate in projects that explore the concepts of space, time, audience and action. Over the three years learners are enabled to develop their own ways of connecting with an audience using personal forms of communication together with a range of performance disciplines. Within the broad themes of autobiography, text and issue-based work, learners explore, develop, rehearse and perform devised work, developing their roles in a team, as well as widening access to the performance experience for learners with complex needs. The project outcomes range from in-house performances through to touring work to regional venues and events. There are opportunities to work in partnership with guest companies and mainstream peers to produce work. Over the years Beaumont learners have used the subject of performance to create work that challenges mindsets and 'This Theatre Company' provides opportunity for ambitious learners to work alongside an external consultant in the external venue of The Dukes Theatre in Lancaster in order to produce a piece or work for tour. Dance Theatre with Plymouth University is informed by the research, scholarship, training and creative practice of the teaching team. As students progress through their degree there are opportunities to collaborate artistically with BA Theatre and Performance students, Media and Music students to generate innovative and exciting performance work. The course offers a number of specialisms and opportunities including Student Performances, a focus on practical dance scholarship, giving value to the skills and knowledge gained in studio practice, Improvisation in Performance, Dance Theatre and Physical Theatre (training and choreography), Integrated Dance Practice, Dance on Screen, Video & Editing Skills and Community Dance Practice. The course also offers extra-curricular training opportunities through master classes, residencies, scheduled weekly classes and performance platforms and work based learning opportunities. There is a vibrant performance and research culture hosting artists and researchers of international standing. For more information about the course including entry requirements and fees, please contact Ruth Way, Head of Performing Arts by email R.Way@plymouth.ac.uk. If you are a disabled student and would like to discuss the course and your access needs, please contact Adam Benjamin by email adam.benjamin@plymouth.ac.uk. This one year course is aimed at young disabled people aged 16-24 and is offered in partnership with Attik Dance. You will develop your practice as an individual and as a member of a performance ensemble. You will be involved right from the start in an in-depth experience of the performing arts, developing your skills in dance, physical theatre and performance making. The units you study on the course will all lead to performances - some of these will be large scale public performances. The course combines specialist performer training with focused development in a range of independent living skills, social skills and self confidence and works towards functional skills in English, Maths and Computing. You will need to have previous experience and a passion for the arts and be 16 years or over to apply for the course. The course will be open to mixed levels and each learner will be assessed as required. Contact the College for details of the application process and for info on courses fees for over 18's. The course is based at the Goschen Centre in Plymouth which is fully accessible. Hijinx Academy is a unique performance skills training course for learning disabled adults from Cardiff and the surrounding area. Students on the Academy study a variety of skills including clowning, comedia dell'Arte, forum theatre techniques and more. The Academy is designed to prepare you for employment as a performer by creating an environment which is as close as possible to a professional rehearsal. Students are expected to work hard and expectations are high in terms of their engagement with the programme. With hard work and dedication Academy students have the potential to go on to perform in our professional touring productions, projects leading up to Unity Festival, Hijinx Pods, Hijinx Residencies, forum theatre projects and all aspects of the creative work which Hijinx produces. The Academy runs on Mondays and Tuesdays each week in Cardiff for 50 weeks of the year. It is open to students aged 18 years and over who live in Cardiff, Newport and surrounding areas. To apply, please contact dan.mcgowan@hijinx.org.uk to arrange a taster. Payment for the course takes place via the student's social services provision. This is a two year formal course requiring attendance on three days each week. The course open is to individuals over the age of 18 years with learning disabilities. A high degree of commitment is required and students pay tuition fees. Graduates of Dark Horse's two year foundation acting course, affiliated to Drama UK Drama School, the Academy of Live and Recorded Arts, have worked in regional and national touring theatre, on television and in film. Acting students develop skills in voice, movement, acting technique; acting for radio and camera, dialects and singing and the course is delivered by theatre tutors and directors to industry standards. Progress is continually assessed via the Company's Actors Scheme competency based system. It is anticipated that residencies at affiliated drama school ALRA (The Academy of Live and Recorded Arts) and performance opportunities will be included in the syllabus. Entry to the course is via interview, audition workshop and trial. For further information please contact Lynda Hornsby at Dark Horse Theatre on 01484 484441 or email lynda@darkhorsetheatre.com. Introduction To Music is a new, accessible music course created by Drake Music in partnership with apt awards (formerly known as OCNSWR - Open College Network South West Region). The course can be accredited at Entry Level, Level 1 and Level 2 and is designed to be fully inclusive, enabling disabled and non-disabled students to work together. Please note Drake Music do not deliver the course, for info on centres which offer the course, contact dmed@drakemusic.org. Introduction To Music combines practical performing and composing activities with learning and assessment resources for Clicker software, which is physically accessible to almost any student. The course comprises four units that can either be taken individually as stand-alone units, or linked together to form a complete course. The units are Music Skills for Performance, Creating Soundtracks for Films, Writing Music Down, Composing Music using Chance Methods. This course is for blind and partially sighted people who wish to develop expertise in visual impairment awareness and Equality Training for the arts sector. For more information or to register interest in becoming an Associate Extant Trainer, please email sue@extant.org.uk. Offers a Trainee Programme for individuals interested in becoming performers and arts leaders. Training activities are run over three stages during the year with ten training days in each stage. Activities include: - professional dance and performance training, - arts leadership training towards becoming a support worker and leader for other people - theatre trips to learn about professional performance and different dance styles - progress meeting to support you to achieve the goals you set for the trainee programme The course is open to people aged 18 years and over and entry is by audition. Course fees are �1,044 for the one year programme. Over the years, Graeae has run a number of more intensive training programmes for disabled actors and performers including Missing Piece and Against the Tide. Contact Graeae for details of any current and upcoming courses. The Orpheus Centre offers placements for full time students and day students. Performing arts, independence skills, functional skills and employment skills are all aimed to equip learners with the skills and opportunities to lead fulfilling and independent lives when they leave Orpheus. Qualifications offered include Trinity Guildhall Arts Awards, as well as City and Guilds Awards. Please see the website or contact the organisation for further information on how to apply. This course has always had an inclusive ethos and strong links with Hereward College, the national college for students with disabilities. Following the first wheelchair user joining the course in 2002 and an in-depth research project Body Realities: strategies for inclusion in dance in HE, a set of actions to help the course be more accessible to a wide range of disabled students was implemented. These included a re-evaluation of the purpose, delivery and assessment of dance technique development within the curriculum, guidelines for studio-based class work and guidance to support the relationship between the Learning Support Assistant (LSA) and the disabled student. Staff continue to be heavily involved in research around dance and disability. The course encourages creativity, exploration and a professional approach to contemporary dance. Students have the opportunity to develop their own artistic practice through study of dance technique, performance, choreography and contextual studies. They also have the option to specialise in teaching and community practice. The core course content includes the following subject areas: - Contemporary dance technique; - Choreography and improvisation including contact improvisation, site-specific performance, dance and film and collaborative processes; - Performance skills with regular performance opportunities in a range of settings and the chance to work in companies during second year with visiting professional choreographers; - Dance history and analysis with an emphasis on post 1960s dance and the option to explore politics and cultural policy in relation to dance. With an emphasis on studio-based learning, the course is delivered through a mixture of practical classes, workshops, rehearsals, lectures, seminars and small group tutorials. National Dance Centres for Advanced Training (CATs) deliver accessible, non-residential, professional training programmes for young people aged 10 to 18 years who demonstrate exceptional potential in dance. Centres are pioneers in prevocational training and research, promoting best practice and providing exceptional and innovative tuition to young people, regardless of their personal circumstances. National Dance CATs are supported through the Government's Music and Dance Scheme and operate from host organisations recognised for their excellence and commitment to the arts and vocational training. Successful applicants are able to access centres across England to receive highly specialist dance training in their locality while continuing to live at home and benefiting from a broad and balanced education. Experts from the professional dance industry nurture and encourage CAT students through a broad range of dance activities; designed to maximise their learning and enable them to excel technically and artistically. The training is individually specified through bespoke training plans helping pupils take ownership of their own learning and realise their personal potential and creativity. The Centres maintain close links with influential dance companies and artists, creating opportunities for children to work with and build relations with future employers, and to gain an inspiring yet realistic insight into the profession. Regular one-on-one tutorials and mentoring offer valuable careers advice and help equip students with the skills to successfully audition for elite vocational dance schools at 11, 16 or 18 years. See the website for details of the CAT training venues across England and for contact information. Please contact CATs individually to discuss provision available for talented young disabled dancers. Please contact your local Music Service or Music Education Hub (in England) for details of current training opportunities for talented disabled young people. You can find contact details for your local Music Service or Music Education Hub here http://www.musicmark.org.uk/about-our-members/music-services-directory. MusicSPACE is a year-round programme of music sessions held in Drake Music Scotland's fully equipped and accessible studio. Tuition includes one-to-one and group instrumental tuition, one-to-one and group song-writing and composition tuition and recording studio training. For further information, please contact the organisation. Music Alive offers a number of weekly sessions for disabled adults including group music sessions, one-to-one sessions and drum circles. Please see the website or contact the organisation for further information. Zinc Arts offers the weekly Advanced Drama class as part of its Creative Plus Programme. Creative Plus offers adults with disabilities the opportunity to learn a range of artistic techniques as well as the fundamental skills needed for self-development and independence. Other courses offered include DanceIT, Film-making and Introduction to Drama and participants may enrol for more than one course. All courses take place at Zinc Arts, in their fully accessible building which has been designed around the needs of disabled people. The cost of the Advanced Drama course is �450 per term. To book a place on the course, please contact Zinc Arts on 01277 365626 or email info@zincarts.org.uk. The Band Academy is an opportunity for adults with learning disabilities to set up and run their own band. Participants will work with other artists to make and record new music, develop singing and song-writing skills, learn how to play instruments and develop music production skills. The band will perform at events across the north-east as well as running and promoting a regular gig night in Newcastle. The Academy runs for 42 weeks per year and costs �39 per day. If you are interested in joining the Academy, please contact the Company. The Theatre Academy is an opportunity for adults with learning disabilities to set up and run their own theatre company. Alongside working as part of a team to develop new theatre performances and developing skills as an actor, participants will learn about stagecraft, lighting and sound and will perform their work across the north-east. The Academy runs for 42 weeks per year and costs �39 per day. If you are interested in joining the Academy, please contact the Company. This one year course is aimed at those with disabilities and is offered in partnership with City College Plymouth. You will develop your practice as an individual and as a member of a performance ensemble. You will be involved right from the start in an in-depth experience of the performing arts, developing your skills in dance, physical theatre and performance making. The units you study on the course will all lead to performances - some of these will be large scale public performances. The course is co-run by the Skills for Life department at the college and includes a life skills programme as well as the following core and optional units: - working in the performing arts industry - professional development in the performing arts industry - performing arts production process. - developing physical theatre for performance optional) - devising theatre (optional) You will need to have previous experience and a passion for the arts and be 16 years or over to apply for the course. Contact the College for details of the application process and for info on courses fees for over 18's. The course is based at the Goschen Centre in Plymouth which is fully accessible. This short-course programme, delivered in partnership with the theatre company, Solar Bear, offers deaf students the opportunity to work on acting and performance skills. It aims to develop techniques and expertise in storytelling through a theatrical language that incorporates British Sign Language, spoken word and visual language. This unique training opportunity is laying the foundations for a BA Acting Degree Course for deaf people due to begin in September 2015 at the Royal Conservatoire Scotland. Places on the short-course programme are awarded through an audition process. For further information contact gerry@solarbear.org.uk or the Conservatoire. This groundbreaking degree course in Acting for those with hearing difficulties is due to be launched in September 2015 in partnership with theatre company, Solar Bear. Please contact gerry@solarbear.org.uk or the Conservatoire for further information. Lawnmowers have provided training programmes for young adults in different aspects of theatre including The School for Fools project which looked at the use of Commedia dell Arte with learning disabled people. Contact the Company for details of current training opportunities. Contact the College for further information on the course, details of Open Days and how to apply. Students have the opportunity to take part in workshops, theatre visits and performances in the community. Your core programme will include functional skills, and the College will also link you up with employers and community groups so you can gain valuable hands-on experience. For further information on this course, please contact ptarling@natstar.ac.uk. A one year course which enables students to experience dance and explore movement and performance skills. To find out more about the course or enrol, please contact Sara Mansfield, Learning Disablity Co-ordinator, by telephone 0207 450 1846 or email sara.mansfield@morleycollege.ac.uk. Have fun learning music in a friendly group. Students make up pieces using voice and percussion, sing and play solo and in a group, and develop their listening skills, confidence and decision-making. To find out more about the course or enrol, please contact Sara Mansfield, Learning Disablity Co-ordinator, by telephone 0207 450 1846 or email sara.mansfield@morleycollege.ac.uk. A one year course offering a creative and supportive environment where students can enjoy developing acting and other performance skills. A range of improvisatory and interactive games and exercises are used on the course to develop confidence and trust. To find out more about the course or enrol, please contact Sara Mansfield, Learning Disablity Co-ordinator, by telephone 0207 450 1846 or email sara.mansfield@morleycollege.ac.uk. A one year course for people with learning disabilities which helps students to learn through singing. Students develop musical skills both working in a group and solo. Enjoy singing and get better at decision making in a relaxed environment. To find out more about the course or enrol, please contact Sara Mansfield, Learning Disablity Co-ordinator, by telephone 0207 450 1846 or email sara.mansfield@morleycollege.ac.uk. Train me up is an accredited training strand in theatre related skills. Working with partners, The Skills Collective, courses are designed, written and taught by professional tutors in a variety of skills with the aim of leading to future employment. Train me up courses lead to an Open College Network (OCN) qualification and involve written work alongside learning a practical skill. L4T is a large scale outreach and research project designed to find disabled individuals who could be the professional actors and theatre makers of tomorrow. We will find partner groups and venues through which we will deliver educational workshops building towards an intensive Autumn programme in 2015. The intended overall outcome of the L4T is to identify a pool of highly talented disabled people from around Scotland who are ready to develop their skills and experience and become readily employable performance and theatre artists whilst at the same time further developing deaf and disabled audiences for theatre and performance works. For further information or to express an interest in taking part in L4T please email l4t@birdsofparadisetheatre.co.uk or phone Birds of Paradise Theatre on 0141 552 1725. Making Theatre is a training course for adults with a learning disability who want to learn new skills. It runs between September and July each year and students can gain a qualification. There is a 4-day per week Full Time programme, and 1-day per week Part Time programme. The programme is open to individuals with a learning disability aged 19 or over. Recruitment takes place in April and is by application. Contact Mind the Gap for an application form or sign up for the newsletter. Students of Making Theatre work on professional shows and projects in order to gain experience and learn a wide range of skills. This includes acting, dance, back-stage and media skills. Making Theatre also helps students grow in confidence and improve communication and team working skills. It also offers support and training for other practical skills such as using computers and travelling independently. Students who are aged up to 25 work towards an Arts Award qualification over the yearlong course. The Young Artists Development Programme was an inclusive twelve month intensive development opportunity for those wishing to move towards a career in the arts and creative sectors, run in 2011 and 2012. Contact the organisation for details of any current initiatives. Heart n Soul have run a number of training schemes over the years for people with learning disabilities. These have included event production and film-making and digital media. Heart n Soul work with individuals to find them real roles in the cultural industry. Contact Heart n Soul for details of current training on offer. Access all Areas recently launched the One Year Performance Making Diploma for adults with learning disabilities in partnership with the Royal Central School of Speech and Drama. The One Year Performance Making Diploma is a one year, part-time, day-time, evening and weekend course which runs from January to July and which develops performance making skills in devised theatre. Commencing in January 2014, the course enables students the opportunity to study physical and devised theatre practices whilst drawing upon contemporary methodology. Students will learn to create their own devised pieces as well as author their own work through solo performances. The course culminates in a final 3 week devising project and a public performance in one of Central's fully equipped performance studios. Entry to the course is by application and interview/workshop and application forms can be downloaded from the Access All Areas website www.access-all-areas-uk.org. 15 places are offered each year with each place heavily subsidised by the Leverhulme Trust. The One Year Performance Making Diploma will enable students the opportunity to study physical and devised theatre practices whilst drawing upon contemporary methodology. Students will learn to create their own devised pieces as well as author their own work through solo performances. The course will culminate with a final 3 week devising project and a public performance in one of Central's fully equipped performance studios. The One Year Performance Making Diploma is a one year, part-time, day-time, evening and weekend course which runs from January to July and which develops performance making skills in devised theatre. It is run in partnership with disability arts organisation Access All Areas. Commencing in January 2014, the course enables students the opportunity to study physical and devised theatre practices whilst drawing upon contemporary methodology.� Students will learn to create their own devised pieces as well as author their own work through solo performances. The course culminates in a final 3 week devising project and a public performance in one of Central's fully equipped performance studios. Entry to the course is by application and interview/workshop and application forms can be downloaded from the Access All Areas website www.access-all-areas-uk.org. 15 places are offered each year with each place heavily subsidised by the Leverhulme Trust. All enquiries should be directed to Access All Areas by telephoning 020 76136445 or email info@access-all-areas-uk.org. Solar Bear provide d/Deaf awareness training to arts venues and organisations across Scotland. Solar Bear believe that training for venue staff is vital if we are to encourage d/Deaf, deafened and hard of hearing people to take part in all that theatre has to offer, whether on stage or off. One of the main barriers that audiences face is access to information and providing transparent and clear information is the first step to setting clear expectations about the experience people are likely to have at a venue. If you are a venue or organisation that is interested in engaging more with your deaf audience and would like to discuss how Solar Bear can tailor a package to meet your needs please get in touch with karen@solarbear.org.uk for further information. The Hijinx Residencies are an opportunity to learn from some of the most well respected theatre companies working in the UK today. Sharing their expertise over week-long workshops, companies such as Complicite, Frantic Assembly, Cardboard Citizens and Ockham's Razor will help you develop performance skills including clowning, contact improvisation, devising and aerial work. Courses start from just £150 for a week and are aimed at learning disabled and non-disabled practitioners. There is a group on the National Theatre Wales website where you can find out more about the workshops - see http://community.nationaltheatrewales.org/group/the-hijinx-residencies for more info. Contact dan.mcgowan@hijinx.org.uk for details of how to apply and an application form. Offers a weekly class for dancers with learning disabilities with some experience to try out ideas, explore choreography, with one-off performance opportunities. There is currently a waiting list for this class - email andrea@corali.org.uk if you are interested in going on the waiting list. Corali also run one-off projects and workshops to share practice and develop artists' skills, contact Corali for info on current and upcoming opportunities. Hijinx produce a wide range of inclusive theatre productions featuring actors with and without learning disabilities. These include Hijinx Pods which are small, portable, interactive performances, and Forum Theatre productions. Contact the Company for details of any current and upcoming auditions and opportunities. The Company also produce the Unity Festival which showcases professional and community programmes of theatre, dance, music, family shows and comedy. If you are an artist or performing company that works in inclusive, disability or learning disabled arts, please contact dan.mcgowan@hijinx.org.ukfor more information about opportunities at Unity 2015.